This topic contains 1 reply, has 1 voice, and was last updated by CKnap 3 years, 2 months ago. Hey guys, I was curious if anyone has gotten any of these boxes before or are currently subscribed? I just subscribed blindly last night, got all hyped up about it being all exclusive content and for a decent price, so I decided to go for it but I did it for the year… Oh well. Anyways if anyone has some reviews on their experience please share! Ill post up pictures and some of the stuff if anyone is interested. 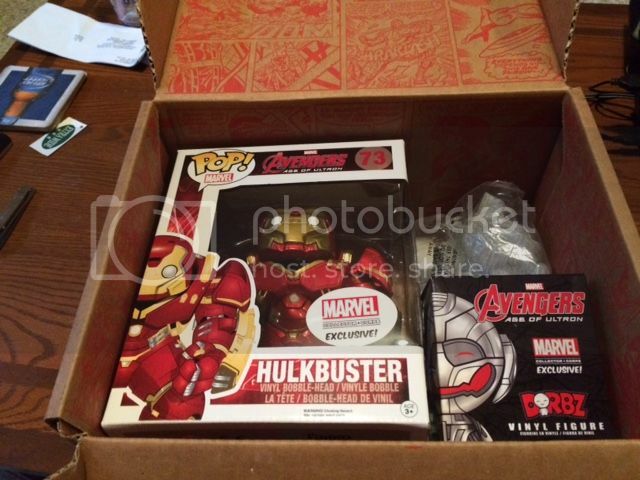 To give an idea to anyone who doesn’t know, these boxes are produced by Marvel AND Funko, they get exclusive T shirts and pop figures and other goodies from Marvel and Funko. The box in the US is $25 + shipping and handling and you are guaranteed a box with $50 worth of items inside. 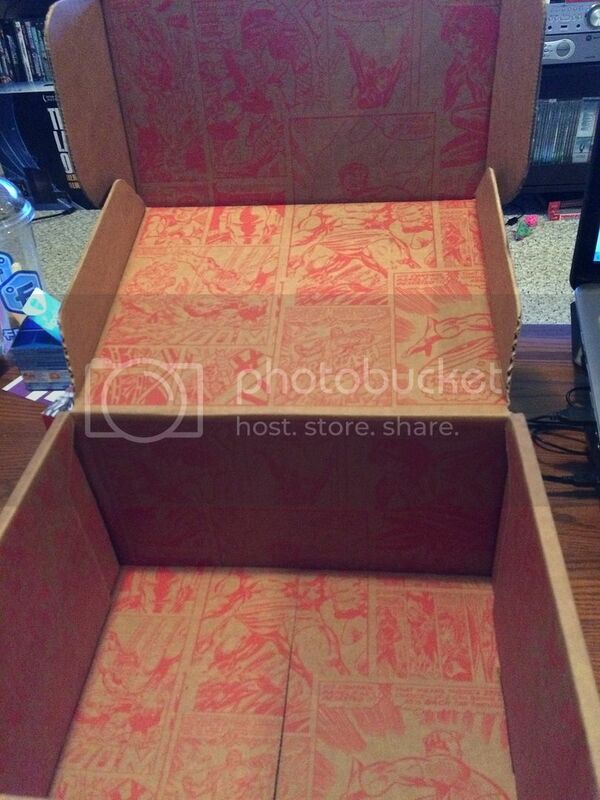 Past boxes include Avengers Age of Ultron, Antman, Villains, Secret Wars and Guardians of the Galaxy. Next box is Deadpool. So I just received my first extra box I ordered, just an FYI if there is no interest shown in this post Ill probably stop posting about these boxes. Now, the box I ordered is the Avengers box, its themed around the Avengers: Age of Ultron movie, I ordered it on January 6 2016 and received it today, not bad. The box came in good condition a slight blemish on the bottom but considering it shipped from Chicago all the way to British Columbia, Canada in good condition make me happy. 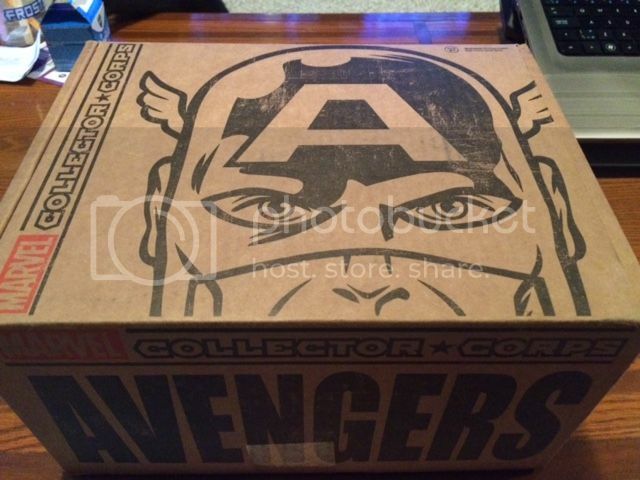 The box has some nice art, the front is of Cap and the inside has the a copy of a comic book page on it, a lot of work for a piece of packaging but very nice presentation. 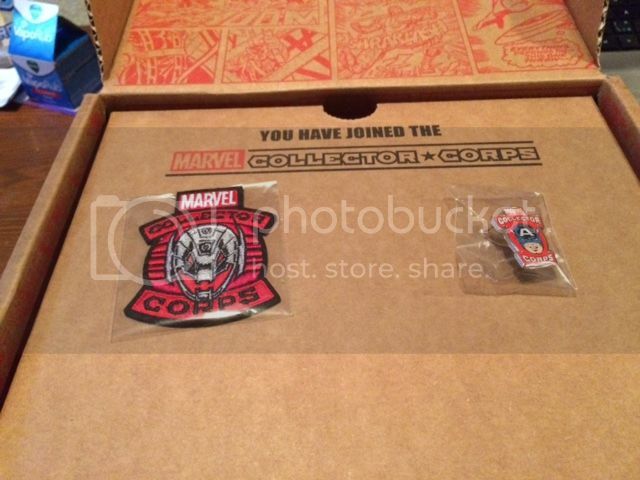 When you first open the box you get the first flap which holds the patch and pin, the patch is a fabric patch of Ultron and it says Marvel Collector Corps, the pin is of Cap. Now the contents inside were a Funko POP! Hulkbuster, (the main reason I ordered this box) it’s awesome if you dont have it, it is worth adding to a collection, now to note, he did come slightly blemished I guess is a good word, anyone who has POP figures knows some of them do, but this seems to be either a clear coat mess or a paint mess, just some spots stand out slightly more than others but its not worth complaining about it could of came a lot worse so im happy. Next is the Funko Dorbz, its of Ultron, I havn’t opened it as im not sure if I want to keep it, if I don’t theres a store nearby that trades toys, we will see. 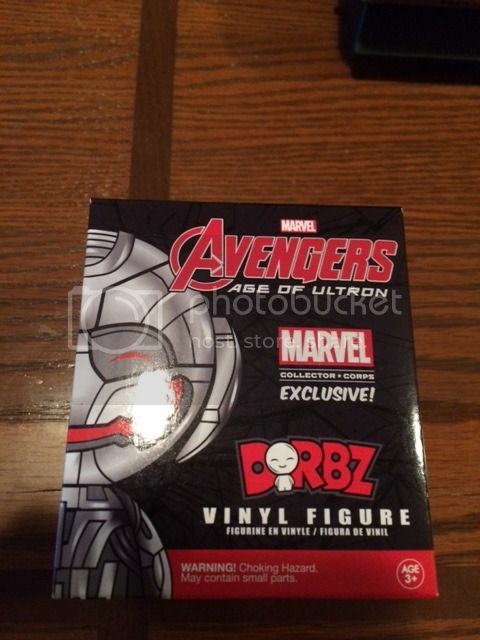 Pretty sure you can get the gist of it from the picture on the box, I dont have any other Dorbz so I dont know if I want to start collecting them too. Next is the T-Shirt, there was 4 different shirts all the same style only difference is the hero, one of Hulk in green, on of Cap in dark blue, one of Thor in light blue and one of Ironman in red. I got the Thor (wanted Hulk!) 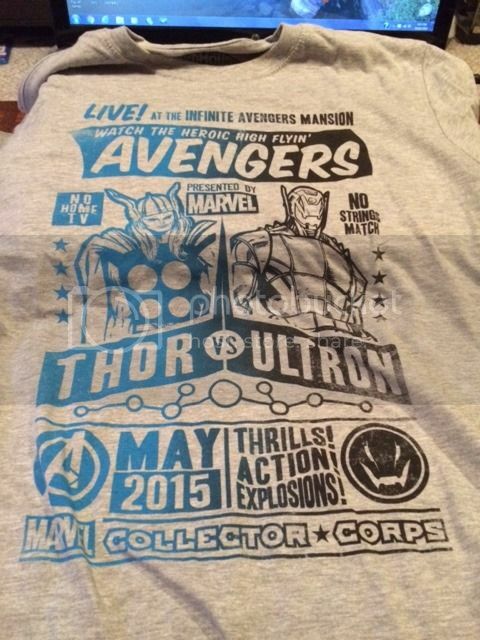 and Ultron. Its a T-shirt, good quality just like something youd buy off Hot topic or something, I like it, to me its like a classic old style Marvel shirt. 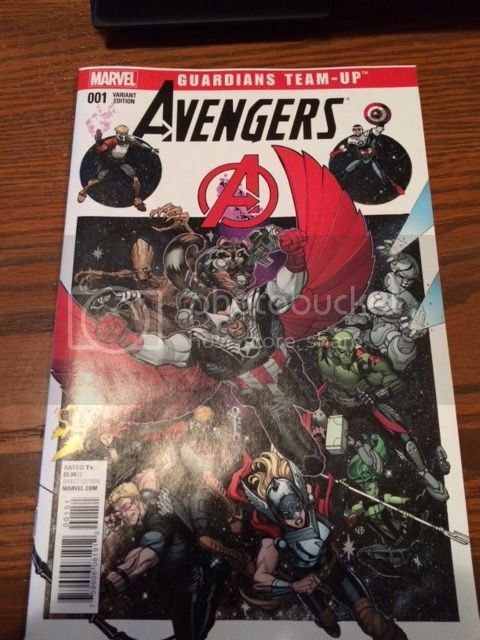 Last item is a Comic book, it is Avengers: Guardians Team-Up variant edition 001, these seem to be already released comic books with a new designed cover. I dont know exactly what comic sorry I dont collect any other than these. I havnt read it yet, it seems to revolve around the Guardians more than the Avengers but looks good. Should make for a good bedtime read! The art is awesome and the story seems to revolve around the Chituari. Im pleased with the box and the items, Im looking forward to February’s box Deadpool, Im also considering ordering another extra box! As I said before if anyone is interested in these posts or seeing the boxes please leave a small comment so I know, otherwise I will stop posting them. Thanks to those that read!